The study hall of Middlesboro (Ky.) High School was no different that Wednesday morning than it was all other Wednesday mornings -or Monday, Tuesday, Thursday and Friday mornings. Or any afternoon of any schoolday. Students with free periods from classes were ensconced in their seats reading textbooks, scratching out homework on pads, or perhaps even letting their silent thoughts carry them off into some far-off dream world. But for one student. Lee Majors - then Harvey Lee Yeary - there was something about the study hall scene on this particular Wednesday morning of January 23 1957, that set it apart from all the other mornings he had been attending high school. Grim sad eyes were shadowed under the thicket of dark, thick brows which heightened the drawn appearance of the young man's face. He looked up briefly from his desk, gazed forlornly across the room, then returned his eyes once more to the folded newspaper which he had been reading. Harvey Lee Yeary's entire concentration was directed upon the first page of the sports section, and upon one story which he had been reading and re-reading. It was a football story. Football was Harvey Lee's game - and his life. His sun rose and set on the gridiron. His world lay between the goalposts. And each five-yard strip betwixt the end zones was a link to the greatest glory a 17-year old boy could ever yearn for. It was perfectly normal for any young man to be spellbound by such thoughts and dreams, and more so for Harvey Lee because he was very much a real, live scholastic football hero. Only seven weeks before, after finishing a highly successful career on the Middlesboro High eleven, where he played end and helped lead his team to a winning 9-2 season record, he was picked for Kentucky's all-state (third) team and went on to play in the schoolboy all-star game. This honor virtually assured the young senior of a collegiate football scholarship - and it was merely a matter of time before the offer came. Some college or university was bound to want him, for he was not only a gridiron star, but also excelled in track and basketball. In fact it was now in the middle of the hoop season and Harvey Lee was burning up the backcourt as a member of Middlesboro's starting five. Yet at this moment his concentration in stufy hall was on that football story in the newspaper - a story that had brought his so much sadness all at once. 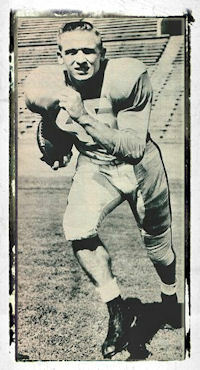 It was the story about Johnny"Drum" Majors, the 21-year-old All-American tailback from the University of Tennessee, who was the key figure in the Volunteers' magnificent unbeaten 10-0 season, a feat that not only earned them No.2 ranking in the nation in 1956 but also brought them into the Sugar Bowl - only to lose that 1957 New Year's Day classic to Baylor, 13-7. But the story was not so much about Johnny Majors' past as it was about his future. It told about his signing a $9,000 one-year contact to play for the Montreal Alouettes of Canada's Big Four League. The occasion brought Alouette coach Peahead Walker to paroxysms of ecstasy as he envisioned what great good deeds Majors would do for the team. "I think Johnny will make a very fine player in Canadian football," waxed Walker. "I plan to use him as a halfback and pass receiver." Alouette's president Leo Dandurand added: "He's the first real triple-threat American back the Alouettes have signed in 11 years. Naturally, we are very happy about it." Naturally, everyone should have been happy. And probably everyone was - except Hervey Lee Yeary. Perhaps because there was more to the story than the announcement that Johnny Majors was going to play in the Canadian league. For young Harvey Lee Yeary the news was devastating because Johnny Majors was his hero, head and shoulders above all other gridiron stars. Havery Lee could not help but idolize the Tennessee tailback. After all, millions of fans across the land had worshipped him as he scampered across the football field to lead the Volunteers to one of their greatest seasons. But to Harvey Lee, Johnny Majors was something special. He was truly a triple-threat throwback to the old days of the single-sing formation. And if ever Johnny Majors had to prove his worth among the behemoths who, ever fall weekend, bruise and batter each other into the trampled turf of this bone-crushing sport, he had done so more than amply the day he reached his peak in Tennessee's 6-0 victory over Georgia Tech, which paved the way for the Volunteers' undefeated and untied season. What was most impressive about Johnny Majors was that he was just 5 feet and 10 and weighed only 167 pounds - a comparative gnome among the hulks inhabiting the modern gridiron - and yet he stood his ground with the best and biggest of them. But that was in college. It was another story when it came to the National Football League draft at the end of the regular 1956 collegiate season. Not one team picked Johnny Majors! "Too small" for pro ball was the collective response of the N.F.L. coaches. The decision to deny Majors a place in the pro ranks, traditionally an automatic honor for any All-American, wasstunning. No one felt worse than the great Tennessee star himself. But if anyone could have felt as badly, that person would have had to be Harvey Lee Yeary, who had hoped someday to emulate Johnny Majors' exploits. Now with the newspaper announcement that Johnny Majors had signed to play in Canada, young Harvey Lee's hope of seeing his hero as a Chicago Bear or a New York Giant was gone. In that shattered dream he also sensed restrictions in his own football future, for Harvey Lee was 5 feet 11, only an inch taller than Majors, but weighed even less than the "too light" Johnny. Yeary was a mere 159 pounds. These were the thoughts that raced through Harvey Lee's mind that Wednesday morning of January 23, 1957, and which ushered in that sudden feeling of disillusionment and defeat. Yet his loyalty to Majors remained unwavering. Johnny would always be his idol. And when he went to college he would try to play the way Johnny did, with his heart and his brain, a combination which helped Johnny overcome the handicap of his size. Not many weeks later, Harvey Lee Yeary's despair turned to unbridled joy when he received notice that the University of Indianna was giving him an athletic scholarship. This was the moment he had lived for. All that bone-crushing punishment he had taken on the football field through the two years he had played on Middlesboro High varsity was well worth it now. Harvey Lee Yeary was going to play in the biggest, toughest, greatest league of all - the Big 10! Well, almost the biggest, toughest and greatest. In some parts of the country, like the part where Harvey Lee comes from, they like to think that the Southeast Conference, with teams like Alabama, Georgia Tech, Duke and Tennessee, play the better, tougher, more sophisticated football. Yet there was no question that it was strictly major league where Harvey Lee was going, and he would have to give his all to make it. He was determined he would make it. Shortly after arriving on the Indiana University campus at Bloomington in September 1957, Harvey Lee filled out a questionnaire which, among other things, asked who his favorite athlete was. His answers: "Johnny Majors, All-American tailback, University of Tennessee." Harvey Lee wanted more than anything to play like Johnny majors, but that was not his destiny After passing his freshman year on the junior varsity, which did not engage in intercollegiate competition, he moved up to the varsity for for the 1958 season. But he soon found that this was indeed a tough league. Harvey Lee tried out as a wingback but he didn't make the starting team - nor, if the brochure for that 1958 team is any guide, was he even assigned a number of his own. What proved particularly discouraging to him was that he wasn't even able to make a team which was fated to become the doormat of the rest of the Big 10 teams that season. Indianna was murdered regularly in 1958 - 54-0 by Michigan State, 47-7 by Iowa, 56-0 by Ohio State, 26-0 by Notre Dame, and 35-13 by Purdue, the Hoosiers' traditional big game. At the end of the season the team sported a 1-8 record. They had managed to beat only Villanova by a 14-7 score, a feat that prompted one sportswriter to remark, "Thank God for the East." In that year the Hoosiers were a far cry from the most recent team, which went through a 9-1 season and wound up in the Rose Bowl. When a reporter recently asked one of the coaching staff of that 1958 team why Harvey Lee Yeary had not made it, the reply was like an echo: "He was too light for Big 10football." "Too small," the pros had said about Harvey's hero, Johnny Majors. Harvey Lee Yeary did not return to Indiana the following year. He transferred to Eastern Kentucky University in Richmond, where he continued his search for a higher education and also for the opportunity to play football - not to watch it from the sidelines. 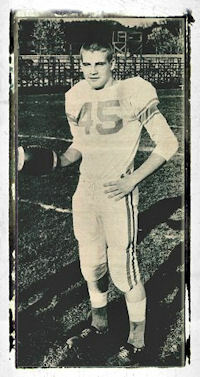 By now, harvey Lee also had an opportunity to meet Johnny Majors, who lived with his family in not too distant Huntland, Tenn. Johnny spoke to Harvey Lee like an older brother, giving him advice on how to put his limited physical dimensions to work on the football field to best advantage against bigger men. Johnny stressed that the little guy can do the job the way he did at Tennessee, with speed, agility, and wile. He encouraged Harvey Lee to go into every game as though it were a championship and give everything of himself that he had to give. "You can't do any more than that," Johnny advised. To Harvey Lee, Johnny Majors was still his No.1 football hero - even if the N.F.L. didn't think so. Johnny's inspiring words gave life a new meaning for Harvey: he found his niche not only on the gridiron, but in other areas as well. Paradoxically, now Harvey Lee also began realizing that life was not just a bowl of football players. He had come to terms with himself on one score, at least. He was not going to be a professional football player. Although he'd do his best as a collegian on the striped turf, he now could see his future elsewhere. Perhaps, he reasoned, he might become a teacher, which was what he had actually started out to be. But even that goal somehow got lost in the many rapidly changing events that crossed his new path of life. The biggest change in the first 21 years of his life came with his marriage to a pretty Richmond, Ky., girl named Kathy Robinson, whose father ran the local paint and wallpaper store. They fell in Love and were married when she was only 16 and still in high school, while Lee was a senior at Eastern Kentucky. Then just before Lee's graduation, Kathy bore them a son. After that, Harvey Lee Yeary's life took a significant new direction. He discovered - after appearing in a few college plays and one season of summer stock - that he could act. He decided to give Hollywood a whirl. He packed Kathy and the baby off to the cinema citadel. But Harvey Lee didn't hit it big. He didn't even make it small. He fell upon hard times - and soon the marriage went on the rocks. Kathy divorced him and eventually went back with the baby to Richmond. But there's already been a turning point in Lee Harvey's life. While attending college, he had met Rock Hudson. After that, all the great mileposts of the past - his aborted career as a football player, plans about teaching, marriage and fatherhood, everything - seemed to be a prologue. A turning point had been reached and his future looked bright. Rock, the long-established actor, the matinee idol to millions of women, could certainly help a struggling down-and-outer like Harvey Lee Yeary. After all, why shouldn't Rock help? It was Rock who had come down to Kentucky and met Harvey Lee and told him he had a chance to make it big in Hollywood. Rock not only promised to help - he did. Soon the handsome 22-year-old product of Middlesboro was on his way to fame - but not before pausing to pay tribute to another very important man in his life. Someone who had done much to influence his life: Johnny Majors. Harvey Lee Yeary was not a name for the screen, decided Harvey Lee Yeary. It didn't have that magical ring like Clark Gable, Gary Cooper, Cary Grant, Spencer Tracy - or Rock Hudson. He had to find another name, and the name he found was the one that was etched deeply upon his pedestal of hero worship - Majors. No, not exactly. Majors was perfect for a surname. But Harvey Lee still wanted something of himself in the name, too. He decided to keep the middle name. That was it! Lee Majors! A name with that magical, mystical Hollywood vibration! And that's the story behind why Lee Majors took another man's name. He did it out of gratitude for the inspiration and help that Johnny Majors provided him during the most important years of his life.